Molly Appleby loves her job at Collector's Weekly covering auctions and estate sales all over the South. When her latest assignment takes her to Richmond, Virginia, to interview the staff of the hit TV show Hidden Treasures, she's expecting a quick, fun trip. But when one of the show's appraisers is found murdered, Molly realizes that once again she'll have to put on her detective's cap until the culprit is captured. As Richmond locals flock to the show hoping that their family heirlooms turn out to be valuable antiques, Molly's busy behind the scenes, interviewing the show's staff and tracking down clues. When yet another staff member is killed and Molly herself is threatened, she's determined to discover which of the expert cast members of Hidden Treasures might be hiding a sinister secret, because no matter how priceless, she knows that no antique is literally to die for. 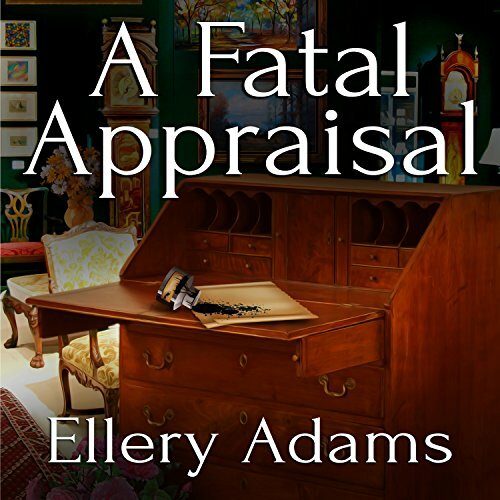 Ellery Adams is one of my favorite cozy mystery writers. She develops realistic characters and places them in real situations. This was another example of her writing skills. While on a writing assignment for Collectors Weekly, Molly stumbles onto scandal and murder. While she is investigating the mystery, she is plagued with doubt over her budding relationship with her co-worker, Mark. This is a very entertaining story. I look forward to the next book in the series. I enjoyed this second installment & feel like there's finally a bit more character building for Molly. During book 1 I was unsure who the main character was as a person; it was very surface level. Molly gets a bit more of an identity in this book & I hope it continues more because right now the characters are still a bit 1 dimensional and sometimes boring. My favorite thing about this series is that Molly is the main character but her partner in crime is her mom. I've never seen that in a cozy before, and it's a sweet dynamic. Molly bounces all her ideas off Clara & enlists her help with investigating. Clara however is much more interested in the antiques themselves, so it makes it quite funny sometimes. The other people in Molly's life seem to be Matt & her co worker (who plays a very minor role). But otherwise the rest of the cast varies book by book. I wish there were more characters that could be developed through each of the books, and that's my biggest "con." I will give book 3 a chance & hope it changes because as of now I'm not invested in any of the characters, which by book 2 a reader should be. They just feel like characters in a story & not characters who I "know." If you're just looking for an easy listen then this fits the bill well. The narration is well done, the stories are intriguing with interesting historical backgrounds & the mystery has its share of twists. You can pick this book up at book 2 and won't feel lost if you haven't read book 1 yet. This series doesn't need to be read in order to be good! This book felt really disjointed to me and there were way too many characters to try to remember. I stuck it out until the end of the book, but I am not sure I will continue the series. The second in Ellery Adams Antiques and Collectibles Mysteries Series is a very good one, although I'm partial to the first one, as I am a pottery lover . . . this one, though held my attention throughout, and I loved the historical information included in and around the civil war battlefields of Virginia, the wonderful stories of furniture making near Williamsburg and Fredericksburg . . . the tales of the antiques make the book . . . and the mystery of the murders, of course . . . great series . . . downloading the next one! I am very glad that this series is being released in audio. I like Molly, and the art auctions and other events that she attends are very interesting. Art collecting is not a field that I'm familiar with, and these books are educational, without boring you to tears with too much detail. There is just enough detail that you can get a feel for what is happening in the book. I am hoping that things continue to go well for Matt and Molly (I was worried there for a bit). I'm looking forward to listening to the remaining books in this series, as they are released. I have pre-ordered each one as they have become available and I will continue to do so. Usually love everything Ellery Adams writes. But definitely not this series. Flat, one dimensional characters with lame, unbelievable plots. However, the worst part is probably the narrator. Talk about flat! Definitely won't waste my money or time on any more of this series. But do read her other works, they're great.